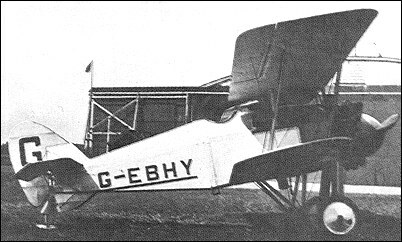 After the Siddeley Deasy Car Co Ltd acquired in 1921 the name and goodwill of Sir W G Armstrong Whitworth & Co Ltd, which had closed down its aviation department, the Siskin was developed from the Siddeley S.R.2 Siskin, a single-seat fighter of 1919. 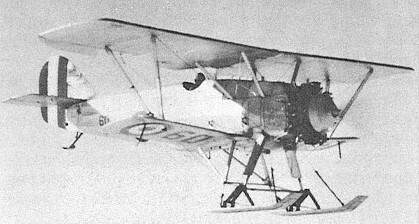 The initial Siskin of all-wood construction flew with the Dragonfly engine for the first time in May of 1919. The aircraft itself proved a capable mount though the engine left much to be desired. Retaining the basic features, the Siskin II was redesigned structurally, with fuselage and wing spars of high-tensile steel tubing and strip. The Siskin II appeared in August 1922 as a two-seater powered by a 325hp Armstrong Siddeley Jaguar I 14-cylinder two-row radial. A second prototype followed in October 1923 was a single-seat fighter. The first prototype was later modified as a single-seater. The Siskin II did not attract any orders, and the second prototype was eventually sold to the Swedish Air Force. The air-cooled radial piston engine was fitted to the extreme forward end of the fuselage sans a cowl and powered a two-blade propeller. The fuselage itself, though all-metal throughout her internal structure, was still covered over in tight fabric and was originally slab-sided and boxy in appearance. This later gave way to a more circular design thanks to an all-new engine installation. As a biplane, the Siskin featured an unequal-span upper and lower straight-wing assembly with slight dihedral. Wings were set in a single bay arrangement and featured V-type struts and were further braced to the fuselage via additional struts located just forward of the cockpit. The cockpit was set aft from the powerplant and was open. The fuselage was capped aft by a conventional empennage featuring a rounded vertical stabilizer and applicable horizontal planes. The undercarriage was fixed in place and consisted of two main single-wheeled landing gear legs and a simple tail skid at the rear. Armament was 2 x .303 (7.7mm) Vickers brand machine guns synchronized to fire through the spinning propeller via an interrupter gear. These were fitted to the forward fuselage just ahead of the pilot's windscreen. An external load of 4 x 20lb bombs was carried externally under the wings (two to a wing). By this time, the British Air Ministry had made a decision to pursue all-metal fighters for their future needs - the fear being that another war could spell shortages of wood and thusly affect the capability of wood-based fighter production in the UK. As such, the Siskin was redesigned in 1923 to incorporate an all-metal aluminum alloy internal frame. Embodying considerable redesign, the Siskin III featured an enlarged upper wing, a lower wing of reduced chord and Vee-type interplane struts. 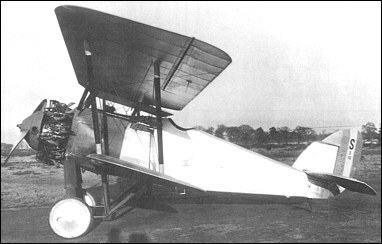 The Siskin III was powered by the 350hp Armstrong Siddeley Jaguar III engine, and was ordered for the RAF to Specification 15/22 and flown on May 7th, 1923. The Royal Air Force (RAF) ordered six for evaluation. Tests were conducted in January of 1924 and proved quite promising to the point that the Siskin III was officially accepted into service with the RAF. The Siskin became the RAFs first all-metal fighter, the first production example flying on 24 March 1924. Armament comprised two 7.7mm Vickers machine guns, and 50 single-seat examples were built for the RAF, one of these later being passed to the RCAF. Twelve two-seat trainer models were also built. The definitive Siskin became the Siskin IIIA, built to Specification 19/23, of which some 348 were produced with 340 of these slated for the RAF and the remaining 8 for the Royal Canadian Air Force. The IIIA brought about a longer fuselage with raised aft decking, greater gap and less upper wing dihedral, redesigned vertical tail surfaces, and a rounded sided fuselage. Performance specifications included a top speed of 156 miles per hour, a range of 280 miles, a service ceiling of 27,000 feet and a rate-of-climb of 2,953 feet per minute. Endurance 1 x 425hp Armstrong Siddeley Jaguar IV or super-charged Jaguar IVS series radial piston engine provided for a good "bump" to performance above 10,000 feet was listed at roughly 1 hour and 12 minutes. Retaining the twin 7.7mm Vickers gun armament, the Siskin IIIA could reach 10,000 feet in just over 7 minutes (7minutes, 5 seconds). 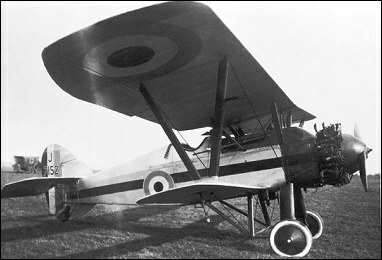 The Siskin IIIA first flew on 20 October 1925, and was ordered for the RAF in June 1926, 412 being built, including 47 dual-control trainers, 17 of the single-seaters were supplied to the RCAF. Of the total production, Armstrong Whitworth built 159, Blackburn 42, Bristol 85, Gloster 74 and Vickers 52. The Siskin IIIB was a one-off experimental prototype fitting an improved engine in a Townend ring. The Siskin IIIDC was a two-seat dual control trainer that was built in 53 examples with deliveries to the RAF, Canada and Estonia. The Siskin IV was a single example civilian racer. The Siskin V preceded the Siskin IIIA and was essentially a development of the Siskin II. The V retained the shorter span upper wing, broader chord lower wing and parallel struts of the original model, but with redesigned vertical tail surfaces, a forward fuselage with rounded sides, and a 385hp Armstrong Siddeley Jaguar III. Armament was two 7.7mm machine guns. An order for 70 was received from the Romanian government and production was initiated early in 1925, but in March 1925 one of the Romanian Siskin Vs was destroyed in a crash while being flown in the UK by a Romanian test pilot, and the order was cancelled. At that time at least 10 had been completed, but no deliveries had been made. Two Siskin Vs were subsequently flown with civil registrations. The Siskin IV, the sole example of which was built for the 1925 King's Cup Race, was similar. The Siskin in British service was fielded by No. 1, 17, 19, 23, 24, 25, 29, 32, 41, 43, 54, 56 and 111 Squadrons. No. 41 Squadron was the first to receive the type (in their base Siskin III forms) in May of 1924 operating out of Northolt and No. 111 Squadron followed. The Siskin IIIA was accepted into service and served the RAF up until October of 1932, which saw the aircraft replaced by the Bristol Bulldog. In Canadian service, the Siskin flew with No. 1 Squadron. Canada originally evaluated two Siskin III models and ended up ordering 12 IIAs from 1926 through 1931. The evaluation versions were initially field-tested through two British aircraft on loan in an effort to validate its in-flight operation in a winter environment. Canadian use of the Siskin spanned from 1926 through to 1939. The Siskin was finally replaced by the Hawker Hurricane in 1939.